In support of the South Korean entry <The Front Line> to be nominated to the 84th Academy Awards’ Best Foreign Language Film category, the Korean Film Council (KOFIC) is holding special screenings and receptions in Los Angeles, Nov. 2 – 3. 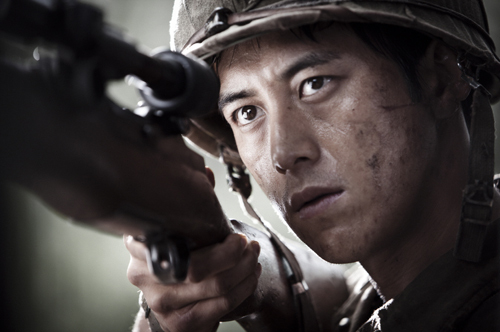 Directed by JANG Hun, <The Front Line>is set at the end of the tragic Korean War when North and South Korean armies were hotly contesting a strategically placed patch of mountainous terrain. Amidst the raging battles and unnatural quiet in between, an officer sent to the front line to investigate a suspicious killing uncovers complicated relationships and twisted secrets. The film was a hit on its release earlier this year, as were Jang Hun’s other films <Secret Reunion> and <Rough Cut>. As part of the local promotion for <The Front Line>, KOFIC is holding a Korean film week retrospective of the former KIM Ki-duk protege’s films with the LA Korean Cultural Center. KOFIC will hold screenings of <The Front Line> for local media and industry professionals Nov. 2 – 3 along with receptions. On Nov. 2, a screening and reception will be held at the CGV LA while on Nov. 3, a “Korean Film Night” reception will be held at the Santa Monica Landmark theater for participants of the American Film Market. More than 300 guests have been invited to each event. <The Front Line> recently sold to Well Go USA for release in the US in the coming months. Director Jang Hun will be in LA for promotional events, meetings and media interviews. Previously, starting with <Secret Sunshine> in 2007, <Crossing> in 2008, <Mother> in 2009 and <A Barefoot Dream> in 2010, KOFIC had provided direct and indirect support to the promotion of South Korea’s submissions to the Academy. However, <The Front Line> marks the first time the governmental organization is carrying out such active local promotion of an Oscar entry.